I didn’t want to continue on my journey with the guard so near and so able to observe my movements. Not that I was doing or even about to do anything illegal, but it would have looked somewhat peculiar, a lone figure heading out onto the desert road on foot, and would surely have piqued the guard’s curiosity and no doubt his attention. Thus, for the next half hour or so I had to stay put and content myself with some sandwiches and my bottle of water. It was also a convenient opportunity to join the frenzy of pyramid photo shooting. While this particular aspect of the pyramids--spread out north to south--was truly magnificent, it was not nearly as spectacular a view as the iconic, jaw-dropping, east-west panoramas to be seen from the vantage points to the south of the Giza pyramid field. From the location here the pyramids seemed somehow disjointed, like pieces of a gigantic geometric puzzle that had become scattered and disconnected, and which needed to be picked up and reassembled. After having taken the third “pyramid-in-my-hand” photo for some grateful American tourists, I overheard the crackling of the guard’s radio. Before long, and with a considerable sense of relief, I watched as he exited from the car park on his camel, heading out across the desert sand in a southeasterly direction--opposite to where I was headed. I didn’t waste any more time, quickly packed my things, and, with one final check that the guard was fully out of sight, made my way once more onto the dusty road. A few hundred yards later the road took a sharp turn, heading almost exactly due south. In the distance I could see the rise of a small hill beyond which was my goal. As I looked to the pyramids in the distance behind me, something rather remarkable was occurring. As I reached the point where I was almost perfectly in line with the diagonal of the three pyramids, the wide gaps between them had completely vanished, giving the illusion that the three individual structures had morphed into one giant, unified body. In this I was reminded of Plutarch’s tale of Osiris and Isis whereby Osiris (the ancient Egyptian god of rebirth and regeneration), having had his body cut into sixteen pieces by his evil brother Seth, who then scattered them all across the land of Egypt, was made whole again after his wife, Isis, had found all the body parts (with the exception of one) and had pieced them together again. I began to wonder if there was in fact a kernel of truth in this ancient myth; whether it could be possible that this story was actually an allegorical tale pointing us toward a fundamental truth that the “body” of Osiris that had been cut into sixteen pieces and scattered across Egypt was not meant to be understood in terms of a human body but was perhaps a metaphorical reference to the early, giant pyramids acting as the “body of Osiris” much in the same way that a Christian church today represents the allegorical “body of Christ.” And further still, could it be that the one piece of the “body” we are told from the myth that Isis could not find may be an allegorical reference to a hidden part, a subtle clue to a hidden vault somewhere deep underground, awaiting discovery--the legendary, hidden chamber of Osiris? 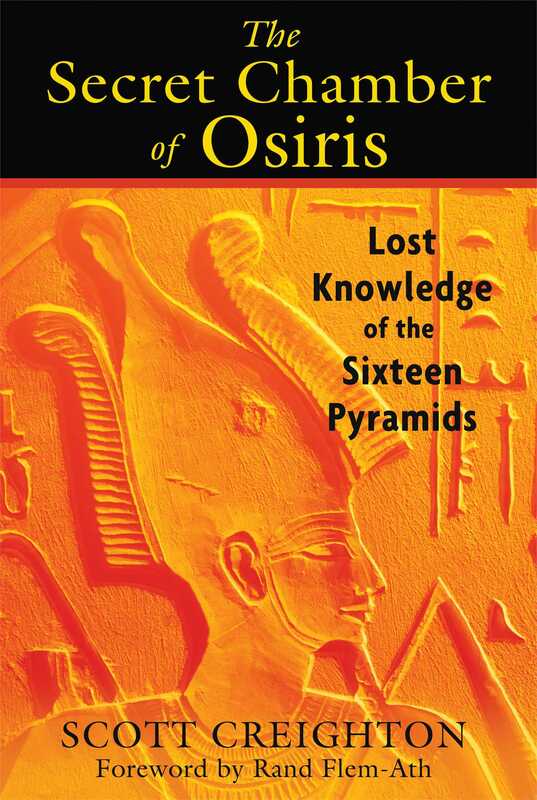 In essence these first scattered pyramids along the Nile Valley were Osiris (i.e., his body cut into sixteen parts), just as the ancient Egyptian Pyramid Texts and Plutarch’s Myth of Osiris inform us. As such it should be of little surprise then to find that when plotting the individual locations of the first, giant pyramids onto a map of Egypt, what we find is a crude “matchstick” outline drawing of the classic Osiris figurine complete with the royal regalia of the distinctive three “pronged” Atef Crown of Osiris and symbols of power, the crook and flail.